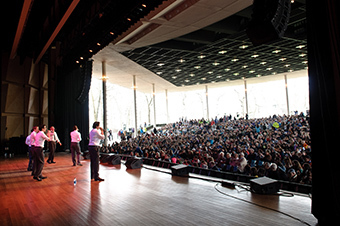 On Sunday, more than 8,000 revelers gathered at Ravinia Festival, in Highland Park, for the Jewish United Fund's 2013 Israel Solidarity Day (ISD) featuring the Walk with Israel, in honor of Israel's 65th birthday. 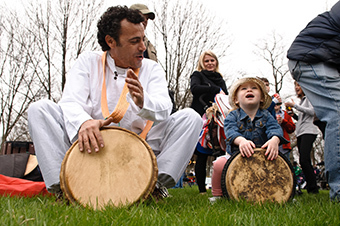 This year, the Chicago-area Jewish community came together for a Sunday in the park—a brand new venue—for one big event filled with exercise, gemilut hasadim (acts of loving kindness), music, food, family fun, and tons of Israeli spirit. 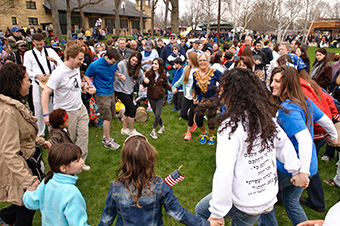 The celebration, in which the sun broke through the clouds halfway through the day, was co-chaired by Rabbi Carl Wolkin, spiritual leader of Congregation Beth Shalom in Northbrook, and Miriam Lichstein, a member of the JUF Women's Board. Honorary co-chairs were longtime friends of the community Gov. Pat Quinn, Sen. Mark Kirk, and Roey Gilad, Consul General of Israel to the Midwest. The ISD rally kicked off the Walk and featured sentiments from Wolkin, Lichstein, and Gilad. Cantor Amy Zussman, of Temple Jeremiah in Northfield, sang the Israeli and American national anthems. 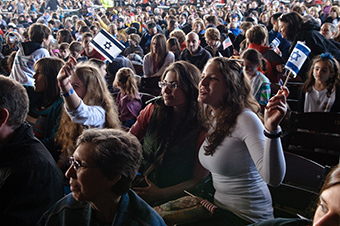 "As I stand here, looking out into a sea of blue and white, it's clear our ruach, our Israeli spirit, has taken over Ravinia Festival today," said Wolkin, energized after his trip earlier this month to Israel on the JUF Israel@65 Mission. 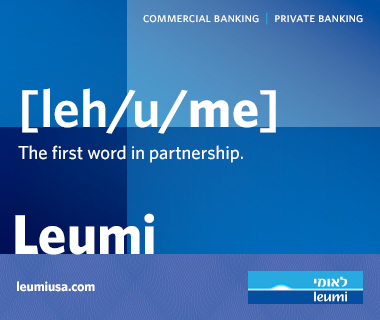 "…Israel has been through so much and come so far. It is a place that is wise beyond its years." Gilad discussed the bond between the Jews of Chicago and the Jews of Israel. "This [day] is for everybody who feels for the State of Israel, everybody who believes Jewish people have the right to establish their own sovereign nation-state…I'd like to send a strong message to our brothers and sisters 6,000 miles away in the Middle East. From the Midwest to the Mideast, you have friends and you should never walk alone." The day of celebration served up an eclectic mix of music and dance--a cappella by the Yeshiva University-based all-male vocal group called the Maccabeats, which culminated with the song "One Day" about their hope for peace in Israel one day; a spirited session of Israeli dancing; plus, the rhythms of the King David Drummers; and, finally, a performance by Matisyahu, the Jewish reggae and rock musician, who's inspired Jews and non-Jews around the world with his unique sound. More than 400 teens, from across the spectrum of youth groups, joined in a service project called the Teen J-Serve 2013, in which they collected books in honor of Israel@65 for at-risk Chicago-area children through Bernie's Book Bank. After the service project, the teens participated in an Israel advocacy program, led by Write On for Israel senior fellows. Dollars raised at the walk benefit Israeli children with the supplies needed to enrich learning and literacy. For example, just $18 supports the Israeli PJ Library early education literacy program by providing Hebrew-language children's books to Israeli preschoolers in JUF's Partnership Together region of Kiryat Gat-Lachish-Shafir. Members of the Supported Community Living Initiative, a grassroots movement for people with disabilities and a collaboration between Jewish Child and Family Services, Jewish Federation, and Keshet, turned out for the event as well. Social media played a prominent role at the celebration. 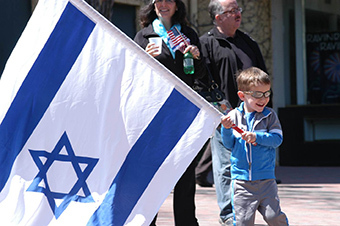 ISD revelers used Instagram, Twitter, and Facebook to show their love for Israel. Participants were also invited to share their own photos throughout the day on the Jewish United Fund Facebook page. Favorite photos will appear in the June issue of JUF News. Lichstein says she was thrilled with the success of the day. 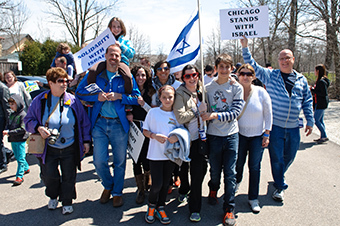 "What an honor it was to be a part of an event that unites the entire Chicago-area Jewish community," Lichstein said. "Israel Solidarity Day is an incredible celebration—and American Jews must continue to support Israel!"